Appointments available Tuesday through Friday from 5 to 8 p.m., and Saturdays and Sundays from 10 a.m. to 5 p.m.
Pet Pics with Santa Returns December 11! 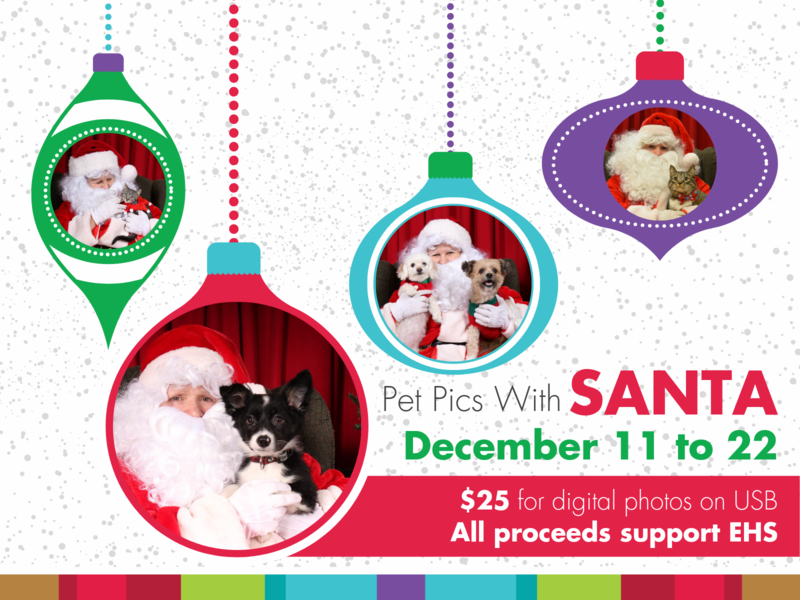 Santa Paws is making a special trip from the North Pole this December to pose with your pets at our annual Pet Pics with Santa fundraiser! Starting December 11th until the 22nd, bring the whole family – pets included! – for your holiday photos with Santa. You’ll receive a USB with digital copies of your photos for only $25, and all proceeds support the thousands of homeless, neglected and abandoned animals that come into our shelter’s care each year. Appointments will be available Tuesday through Friday from 5 to 8 p.m., and Saturdays and Sundays from 10 a.m. to 5 p.m. Please book your appointment online in advance, as this is a popular tradition and spots will fill up quick! For the safety and enjoyment of all companion animals, please keep dogs on leash and cats / other pets in carriers or on leash until it’s your time to meet Old Saint Nick! Don’t let your pets miss out on the catmas cheer this howliday season – bring them to #PetPicsWithSanta! Please note: due to the popularity of this event, appointments must be booked online in advance. Walk-ins will not be accepted.